Ask fellow campers about "Cloquet / Duluth KOA" and nearby attractions. On a positive note, the dog park is large, clean and securely fenced with pick up bags. We camped at Cloquet / Duluth KOA in a Fifth Wheel. Nice park located out of the way and secluded. Nice and quiet and a small park. Very clean. Good cell service and local TV channels. We camped at Cloquet / Duluth KOA in a Motorhome. Shopped at WalMart for everything. Would have rated it higher, but the sites could use a little more gravel on them, as our site was pretty muddy. Nice store and TV lounge, got all 4 networks on my bat-wing with a strong signal. Campground was full, but only one person in the office - had to wait both times I needed something. We camped at Cloquet / Duluth KOA in a Motorhome. I believe KOAs vary a lot - some are premium fancy setups and others are roughing it. This isn't a fancy KOA. It doesn't have any of the fancy premium sites with patios and grills, etc.. It does have a mix of sites, though, from wooded, private sites to pull-thrus which are seemingly on top of each other. Cabins, too, which are a cute option. Some here looked a little aged but I didn't see inside them. It's a bit off the highway, but quite near Cloquet. If your destination is Duluth, I'd probably look elsewhere first but day tripping is possible for sure. Our site was #23 which was plenty big enough for our 32 foot trailer and truck to fit on. It was unimproved - just grass, but had 2 fire rings for some reason and an ok picnic table. Site 24 was so close to us. I felt badly as their awning was only a few feet from the side of our camper. The map of the campground leads you to believe these few sites are much wider than that. There was a little bit of garbage on the ground of our site near the fire ring. I can't erase that from my mind and it leads me to have an overall impression of trashy when I think about it. However, in reality, we thought the park was decent. They have some of the nicest bathroom facilities I've ever encountered at a KOA. The workers were all pleasant (a shock to me as my usual impression is the opposite for KOA workers). We had our dog and the dog walk was near a railroad track. We ended up walking some residential roads, too, with the dog. For a stop over it is a workable choice. If you have young children, there is a pool and a small rec room. Nothing fancy but enough. Perhaps in the wooded section you'd feel compelled to stay longer, but otherwise in and out was enough. Dump station easily accessible at entrance. 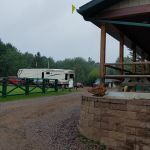 We camped at Cloquet / Duluth KOA in a Travel Trailer. Typical KOA. Spots are close together. The hot tub wasn't working (low water level) but pool was nice. We had a pullthru with E/W. The attendant led us thru a very tight roadway to get to the site and I had to be extremely careful not to hit a tree. Lots of branches scraping alongside the trailer though. Wasn't impressed. Sites were setup so we faced our neighbors patio too. Weird. 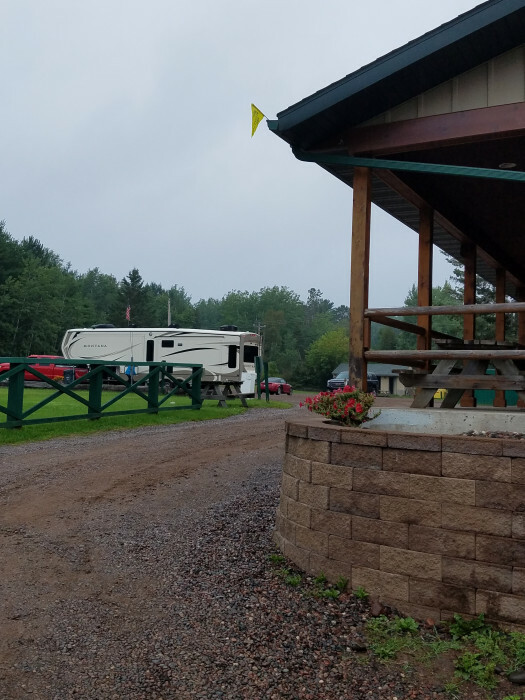 We camped at Cloquet / Duluth KOA in a Travel Trailer. It rained the entire 3 days we were there. The drainage was not good. Of course we were in a field with no gravel or cement. We camped at Cloquet / Duluth KOA in a Fifth Wheel. We went to Dulth, MN and drove the North and South Shore of Lake Superior. It was lovely even if it was raining. Did a little shopping in Duluth. Nice pool. Hot tub (the kids do use it). Laundry (3.00/load.) Clean restrooms. WiFi spotty. OK Verizon signal, 3 bars. Before accepting a site you may want to inspect it first for level, electrical, and tree branches. There are shared electric poles. We thought we had 50 amps on the pole, turns out we were only given the 30 amp plug. 50 amp was for the next site. We did relocate to a 50 amp back-in site but the electrical insulator was damaged. Sites are close together. 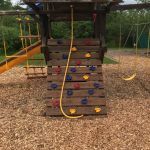 The park needs an electrical upgrade and general maintenance. The trains did not bother us. Heard them a few times, and if you are a light sleeper it may bother you at night. Not all sites have sewer, but they have a free pump-out service. Site 5 had only 30 amp and tree branch issues and was not satellite friendly. Relocated to site 29. Easy back-in, satellite friendly, level, 50 amp. No sewer. Overall, thought it was a bit expensive for the quality of the campground, but not much else to choose from near Duluth. We camped at Cloquet / Duluth KOA in a Motorhome. Kampground Road is a private road off the main road, your GPS may not take it. Use coordinates, or name of campground. Watch pulling in 90 degree right hand turn by office. Go down a bit further and take the second drive if you have a larger rig. We camped here in our 36' motorhome. Go see the Glensheen Mansion, worth a visit read up on the family history first! Cost includes surcharge for 3 extra people ($12), using a tent. Be advised that you risk expensive damage if camping here with electricity. Other reviews have covered the basics of this campground. We found most of the already mentioned negatives not to be big issues. There were trains, but even our 2 yr. old slept through them (in a tent!). They delivered firewood to the site. It appears they even restocked us with additional the next day, at no charge. WiFi was present, but as typical for most campgrounds, virtually unusable due to demand during peak periods. Bad electricity alone would have earned a low rating. Although they responded by sending their electrician over, there was no solution, except to move to one of two very marginal sites, where it was unknown if power was better. Our last evening, there was a very large thunderstorm. We arrived back about an hour after it had passed. A crew was finishing up clearing a couple of downed trees that were on, but not blocking, the main entrance road. Tent had been uprooted, and the fifth was surrounded by 4" of standing water out to about 25 feet. No access but to wade. No place for the tent, except in the lake that was our site. There was no response from the staff. When I informed the office that we were leaving due to being flooded, I was met with a shrug. No offer to try to relocate, or even a show of concern. Requested final pump out was denied as the crew was busy with the scheduled ice cream social (despite storm cleanup/flooding!?!) I did later see the honeywagon pass by, and the driver agreed to stop and pump us out. Storms and other such natural things happen and this was not a disaster, much of the campground came through in great condition. In the State Park, I would have accepted it as part of camping. But when paying premium prices, one expects infrastructure that works, and a bit of an attempt to moderate the displacement of their customers. We camped at Cloquet / Duluth KOA in a Fifth Wheel. We came in during the storms - tornado warnings, hail and the whole bit. Overall our stay was uneventful - no major issues with the site except it was a few feet away from the neighbors and open - but during the tornado warnings the staff had everyone and their dogs come in to the main building. They worked to accommodate everyone, and that was rather pleasant! That said, they didn't enforce things like pool rules (children were diving and being reckless) or the hot tub rules (children as young as 6 were in the hot tub!). The grounds were well kept, clean and the bathrooms were amazing. The showers were clean, the water hot and private and the bathrooms were clean. We were really close to our neighbors, literally feet away, and there was no dog park - you had a path next to the railroad tracks to walk dogs! There were trains that came by - we counted over 10 last night - but we're used to living near trains so it wasn't a bother for us. But if you aren't used to them, it's something to consider. Overall it was a positive experience with a few detractors that kept it from being excellent. Overall a good site, and a pleasant stop on our way. We camped at Cloquet / Duluth KOA in a Motorhome. We found the staff to be organized and accommodating. This is the only park we've stayed at where there is trash pickup service at every campsite, and one of the few where firewood is delivered neatly stacked without a plastic wrapper or tie that has to be removed. 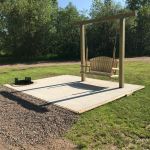 We had a full-hookup site, and all utilities were functional, with the electric pedestal showing signs of recent updating. Access roads and pads are gravel and were well maintained. Space around pads is grassy with quite a few trees. There were a number of organized events though we didn't participate. There's laundry, a store, and a game room, though we didn't use them. As other reviewers have noted, an active rail line abuts the property. We heard several trains during our stay but did not find the noise level objectionable. Our site was further away from the line than some others, and we were sleeping inside with the windows closed. Had we been in a tent, I believe the noise would have awakened us in the middle of the night. Sites are more closely spaced than I would like. 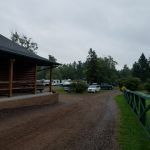 We camped at Cloquet / Duluth KOA in a Travel Trailer. Nice train at 2 and again at 4, was awakened both times. Bathrooms and showers clean and nice. Very secluded, gravel pads. Had trouble with satellite. Small hot tub. Overall acceptable except for train noise. We camped at Cloquet / Duluth KOA in a Motorhome. Duluth was great! Go down to the waterfront, neat shops and eateries. Take the north shore drive for breathtaking sea scales. We stayed only one night as we were passing thru. One of the nicer KOAs we've stayed at in Minnesota. The positives: The staff was fabulous. The bathrooms and showers were clean. I loved the game room and TV room. There were plenty of activities to keep busy. Sites are gravel and level. The negatives: Some of the campsites were small, and too close together. Our neighbor's fire ring was right outside our trailer. We had a pull-thru site, but our trailer barely fit on it, and there was no room for our tow vehicle. For a pool that small, it didn't have much space at each depth level, so kids who are not strong swimmers didn't have much space to splash around. Hot tub is nice, but very small; only a max of 3 persons allowed. Trains were LOUD (and I live near an active rail line). Reminded me of the movie My Cousin Vinny...horns blasting at all hours and woke us up. Overall it was a nice place, but I don't know that we'll stay again. 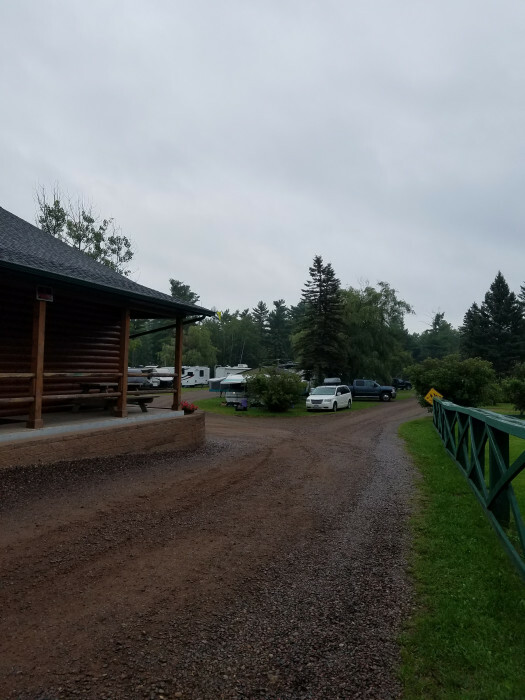 We camped at Cloquet / Duluth KOA in a Travel Trailer. Easy access even though it is 13 miles south of Duluth. The drive to Duluth and the North Shore is easy. Nice, well kept park. Staff is very knowledgeable about the area and we got great tips. WiFi was some of the best we have experienced. We camped at Cloquet / Duluth KOA in a Fifth Wheel. The Minnesota Munger bike trail has a parking lot about 2 miles away. The bike trail is wonderful. The Scenic North Shore drive to Split Rock Lighthouse is a must. Also enjoyed the harbor cruise. Stayed one night passing through. We had a nice pull through & level spot, which helped. Friendly reception. The spa heater wasn't working but the pool was nice. 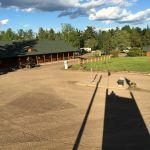 We camped at Cloquet / Duluth KOA in a Travel Trailer. This is a pretty typical small KOA--expensive for what you get. They cram too many sites in the space available. If they would remove every other site, it would be fine. They have sites that are long enough to fit big rigs but only 3 sites are 50 amp full hookups, so call ahead if you need that. Sites were gravel and level. Wi-Fi worked well. Generally, it is easy in/easy out; however, a couple of limbs needed trimming and one telephone pole could pose a problem if you take the wrong path out of the park. AT&T had a weak signal and Verizon had a strong signal. The trains were pretty frequent during the day, thankfully less so at night. We'll probably stay somewhere else next time. We camped at Cloquet / Duluth KOA in a Fifth Wheel. Kampground Road is a private road off the main road, your GPS may not take it. Use coordinates, or name of campground. Watch pulling in 90 degree right hand turn by office. Go down a bit further and take the second drive if you have a larger rig. We camped here in our 36' motorhome. Go see the Glensheen Mansion, worth a visit read up on the family history first! Are you affiliated with Cloquet / Duluth KOA ?